Use Vialogues.com to facilitate discussions in the high school classroom around events and issues surrounding the 10th anniversary of the September 11th terrorist attacks. Computers, headphones & access to Vialogues.com. After creating a Vialogues.com account you can find sample vialogues we have created for you to use by entering the following hash tag: #9/11Anniversary into the advanced search bar. Please Note: You can create new, private vialogues for your class from each of these existent vialogues. Check-out this page for help setting-up a private vialogue for your class! High School-level students will use Vialogues, an asynchronous video-discussion platform developed at Teachers College, Columbia University, in-class to facilitate, annotate and record their thoughts around the events and ramifications of September 11, 2001. 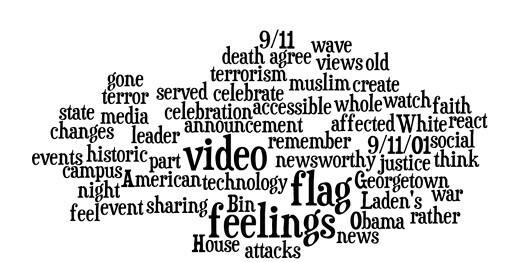 Ask students to view and add their thoughts to three of the vialogues from the #9/11Anniversary series. Remind students that they may reply to peer comments and answer specific questions (multiple choice, short answer & likert) that you have created around this vialogue. Additionally, you may create polls to track student response. After a selection of vialogues has been viewed read-out key student comments. -Which comments helped you to understand the issues and events discussed in the vialogues the most? Why? -Did watching these videos and sharing your thoughts in writing help you to better clarify your own feelings about these events and their impact on our country? -How did your ideas, thoughts and feelings about these events change after watching these vialogues and contributing to today’s discussion? Finally, have students copy their comments from these three vialogues into a Wordle word cloud (see example below). Display these visualizations in the class & have students explore the recurrent themes, invite your school to participate in this project and create a school-wide display of these word clouds for students to explore. How did this activity affect your views of the terrorist attacks and the ramifications for our society? What commonalities are present across all student word clouds? What words stood-out the most?